Hey folks, did you know we serve brunch EVERY Sunday? That’s right. 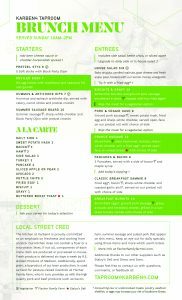 AND we’ve recently updated our menu…. Come hang out with K4 on this Sunday Funday…we’ve got lots of games, 3-70″ TVs & of course our beers. Grab those friends & get your brunch on!